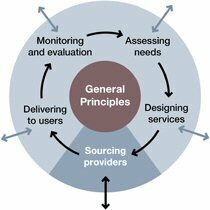 Once commissioners have assessed needs and designed suitable services to meet them, providers of those services need to be found and engaged to deliver them. This sourcing of service providers can lead to financial relationships with third sector organisations (TSOs). The next key question raised with us by commissioners was whether and when they could or should use grant making or procurement to establish a financial relationship with a TSO. This is an important question since the approach chosen will govern the initial process of allocating the money and shape the ongoing relationship between the commissioner and the TSO. But this is a complex question to which there is no definitive answer. When can you use grant? When can you use procurement? What are the practical issues around using grants and procurement? What about grant-in-aid – or strategic grants? Pooling money and what goes with that. Next: When can I use grant?